There’s something about baklava that just sounds so fancy. 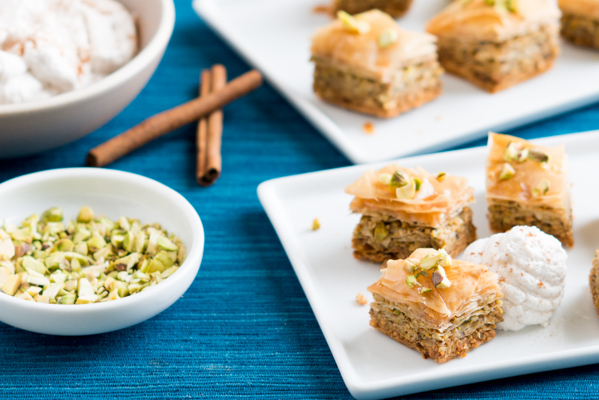 Sure, you could whip up mini cupcakes or little cookies for your next shindig – but if you make baklava, you are almost guaranteed oohs and aahs of the most epic proportions. And guess what? It’s really not that hard to make, as long as you have a little time to devote to it. Making baklava is all about patience. This version of baklava is made mini and filled with both pistachios and walnuts. Then the layers of flaky, buttery goodness are bathed in a honey-sugar-vanilla mixture that makes it absolutely delightful. Finally, finish it all off with a swirl of cinnamon laced whipped cream. Sound good? 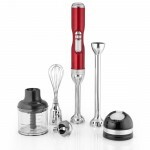 Grab your KitchenAid® Pro Line® Series Cordless Hand Blender and let’s get started! Start by preheating your oven and buttering your glass 9×13-inch baking dish. Then, make your filling. 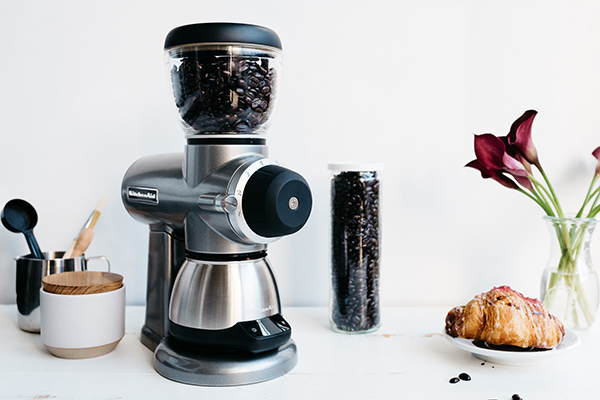 Simply combine the walnuts and pistachios in the bowl of your KitchenAid® Pro Line® Series Cordless Hand Blender and whirl until they are fine pieces. Transfer the nuts to a bowl and stir together with cinnamon and pepper. Yes, pepper. 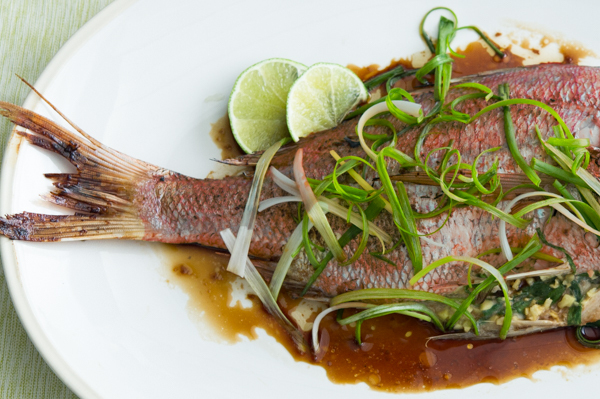 It adds a little oomph to this recipe. Then, layer two sheets of phyllo dough, butter them and add two more. Continue until you have eight slices in the bottom of the pan. Sprinkle that dough with about 1/4 cup of the nut mixture. Top with two more slices of phyllo, butter and repeat. Keep going until you’ve used all the filling. Then, finish it off with a layer 6-8 phyllo slices thick. Butter the top. Next, you want to cut the baklava with a sharp knife. Yes, before baking – otherwise you won’t get those pretty diamonds of sticky baklava goodness at the end. Make diagonal slices about 1 inch apart going in perpendicular directions. Bake that baby for about 45-55 minutes. It will get all golden and crisp. Yum! When the baklava is just about done, stir together the water, sugar, honey and vanilla in a small saucepan over medium heat. Once that mixture becomes translucent, it’s time to pour it over the fresh-from-the-oven baklava. It will bubble like crazy when you do. That’s good. Once you’ve poured it all over, let it sit for at least four hours. Now, cut it again – along those same lines you created before baking. Finally make the whipped cream: Place the heavy cream, sugar and cinnamon in a large mixing bowl and use the KitchenAid® ProLine® Series Cordless Hand Blender to whip to soft peaks. Chill until ready to use. Hungry? Dig in – or share with friends! Preheat the oven to 350 degrees. Butter a 9×13-inch glass baking dish. In the bowl of a KitchenAid® Pro Line® Series Cordless Hand Blender, pulse the walnuts and pistachios in batches until finely chopped. Transfer to a mixing bowl and stir together with cinnamon and pepper. Lay 2 pieces of the phyllo dough in the buttered pan and brush with butter. Repeat, 2 slices at a time, until 8 pieces of phyllo have been stacked. Sprinkle with about 1/4 cup of the nut mixture. Top with two pieces of phyllo and butter, followed by 1/4 cup of nut mixture. Repeat until all the nut mixture has been used. The top layer of the baklava should be 6-8 slices thick and buttered on top. Using a very sharp knife, cut on a diagonal, leaving 1-inch between cuts. Repeat in the opposite direction to form a diamond pattern. Bake for 45-55 minutes until golden brown. When the baklava is just about done, combine the water, sugar, honey and vanilla in a small saucepan and heat over medium heat, stirring constantly, until its translucent. Once the baklava is removed from the oven, pour the syrup mixture over it, taking care to spread it evenly around the pan. Let sit, uncovered, for at least 4 hours before recutting and serving with whipped cream. To make the whipped cream, place the heavy cream, sugar and cinnamon in a large mixing bowl and use the KitchenAid® Pro Line® Series Cordless Hand Blender to whip to soft peaks. Chill until ready to use. As a diabetic, I would probably never make this particular recipe. However, it bothers me that NONE of the recipes provide nutritional information. Those of us on insulin have to determine the carbohydrate count per serving in order to figure out the insulin dose we would need. And of course there are other people with dietary restrictions, such as low-sodium, low-fat, etc. Since figuring out that information on my own is extremely time-consuming, I choose not to use any recipes that do not provide that information. Thank you so much for taking the time to leave a comment on our blog. I apologize that we do not provide the information you are looking for, but we will certainly take your suggestion into consideration for the future. I agree with Ruth, we nutritional value for your recipes! !!! 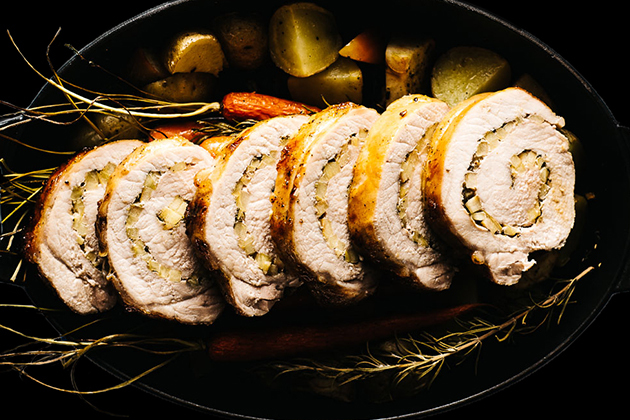 Can you add some recipes using the kitchenaid steam assist convection oven? I love mine but need some more recipes for it. Thanks!